Sensitive teeth are particularly problematic because patients often go for years tolerating the pain, fearful that they’ll be subject to root canals and other, more involved procedures. But this simply is no longer the case. The solutions are many, depending on the severity and extent of the sensitivity. Think of your gums and the enamel on your teeth as a down comforter covering and protecting your body from the cool winter air. Over time, the gums may recede or the enamel or dentin on your teeth may wear down, creating the conditions for tooth sensitivity. Improper brushing — brushing too hard! Loss of enamel, resulting from highly acidic diets (tomatoes, soda, etc). Desensitizers come in many forms, from simple at-home remedies to in-office solutions applied by one of our hygienists. For mild cases where patients complain of low-level hot, cold, sweet, or sour sensitivity, many people do well using desensitizing toothpaste. Toothpastes for sensitive teeth must be used daily for the most effective results. In addition to these toothpastes, other desensitizing products include over-the-counter rinses and gels. Many over-the-counter desensitizing products offer a variety of flavors and additional benefits, such as tartar control and fluoride for cavity prevention. So ask us what product is best for you. For very sensitive teeth, an in-office clinical desensitizer can be used first to knock down the sensitivity, and a desensitizing toothpaste can be used for ongoing maintenance. In-office desensitizers can be painted or sprayed on while you are in our office. They can last a week, several months, or, in some cases, it’s all the patient ever needs. In-office desensitizing is quick and painless. The desensitizer is allowed to dry on the teeth and, just like that, the patient has a new protective shield against sensitivity. The worst thing you can do is nothing at all. In fact, failing to address sensitive teeth can cause other oral problems down the road. Sensitive teeth are easily treatable and usually involve a pain-free solution. Call us for an appointment at 203-758-2116. Fluoride strengthens your teeth and may help to prevent tooth decay. It is found naturally in some water sources, as well as foods, including meat, fish, eggs and tea. Various toothpastes and rinses also contain fluoride, as well as most municipal water supplies. Many dentists agree that the best way to prevent tooth decay is to use several sources of fluoride, including professional fluoride applications in our office, and prescription fluoride tablets for those children who do not get fluoride in their water. The visible part of your natural tooth is called the crown. The outer layer of the crown of your tooth is called enamel and is made of closely packed mineral crystals. The tooth enamel loses minerals (demineralization) and gains minerals (remineralization) every day. These two processes typically balance each other. The type of bacteria that causes plaque on your teeth feeds on sugar in your mouth and produces acids. The acids dissolve the mineral crystals in your teeth and start demineralization. The remineralization process builds the enamel back up, meaning that minerals such as fluoride, calcium and phosphate are deposited inside the enamel. Tooth decay occurs when there is too much mineral loss and not enough repair. Fluoride strengthens teeth by helping to speed remineralization. Fluoride also makes teeth more resistant to dissolving bacterial acids. Your teeth can absorb fluoride in two ways, internally and externally. Internal absorption occurs when children absorb small doses from the food that they eat, as well as water that they drink and supplements that they may take. When ingested, fluoride enters the bloodstream and becomes part of the permanent teeth as they develop. This strengthens the teeth and makes it harder for the acids to destroy the enamel. Fluoride treatments are routinely given to children as their teeth are developing. Your child should use additional fluoride if he or she has a history of cavities or is at high risk for decay. Many children get fluoride treatments every six months. These treatments provide additional protection against cavities, even if your child already drinks fluorinated water. If your child is over the age of 6 and has a history of cavities or is at a high risk for decay, fluoride mouth rinses can help with remineralization. You can find these rinses in the mouthwash section of most stores. Our doctors may also prescribe fluoride rinses and gels which provide a higher level of fluoride than the over-the-counter rinses. For children between the ages of 6 months to 16 years who have well water at home or who don’t drink fluorinated water, fluoride supplements may be prescribed by our doctors or your pediatrician. These supplements are available as liquids for younger children and tablets for older children. Many over-the-counter and prescription drugs can cause your mouth to be dry; they include antihistamines and medications that treat high blood pressure, anxiety and depression. Without sufficient saliva in your mouth, tooth decay worsens. How is the fluoride applied? Fluoride treatments are used for both children and adults. Fluoride treatments provided in our office contain more fluoride than over-the-counter products, including toothpaste and rinses. They are also different chemically and stay on your teeth longer. We use two types of fluoride in our office: acidulated phosphate fluoride and neutral sodium fluoride. Neutral sodium fluoride is used for people who have dry mouth (xerostomia), tooth- colored (composite) fillings, crowns or bridges. APF is acidic and may irritate a mouth that is dry, and it can create small pits in composite fillings. Please brush and floss your teeth thoroughly before your appointment. Fluoride can be applied as a gel, foam or varnish. It can be painted directly on the teeth or it can be applied using a tray, much like a mouth guard, for 1-4 minutes. 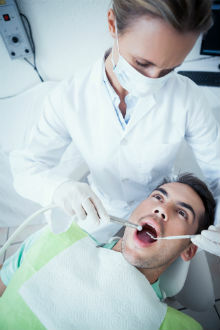 Our hygienist will first dry the teeth so that the fluoride is not diluted. Although fluoride comes in various flavors, it should never be swallowed! Don’t eat, drink or smoke for at least 30 minutes after your in-office fluoride treatment. This helps to increase the fluoride’s contact with the teeth. When used properly, fluoride is safe and effective. Everyone should use fluorinated toothpaste. Be aware that young children are more likely to swallow toothpaste than to spit it out, especially when they are flavored. Use only a pea-sized amount of toothpaste to brush their teeth with and encourage them to spit out as much as possible. Prescription fluoride supplements are usually given to children. They are taken in small quantities and are based on the child’s age and the amount of fluoride in the water that he or she drinks. If you have any questions regarding fluoride treatments, please talk to our hygienists, our doctors or your pediatrician. High doses of fluoride can be harmful. We do not recommend fluoride supplements for patients that drink fluorinated water. Young children, in particular, should be supervised during in-office treatments and when using fluoride products at home. Toxic fluoride doses are based on body weight. For example, a toxic dose of fluoride for an 8-year old child weighing 45 pounds is 655 milligrams (mg). In comparison, an 8-ounce glass of water with 1 part per million (ppm) of fluoride contains 0.25 mg of fluoride. A small amount of toothpaste contains 0.24 mg of fluoride. These fluoride containing products are used in such small amounts that it is very difficult to receive toxic doses in a home setting. Young children should be supervised when using fluoride treatments at home. If they swallow too much fluoride they may become nauseous. Too much fluoride can also cause spots to form on the enamel of any developing teeth. The spots will be visible as they come into the mouth. Our hygienists and our doctors can answer any questions or concerns you may have regarding fluoride use. We will gladly discuss what fluoride treatments are appropriate for you or your child. Oral cancer is one of the deadliest forms of cancer. Only about half of people diagnosed with oral cancer survive more than five years. That’s because cancer in the neck and mouth spreads quickly, and it often isn’t found until it’s very advanced. Anyone can get oral cancer, which includes cancer of the throat, lips, mouth, tongue, gums and salivary glands. Although smoking increases the risk of oral cancer, more than 25 percent of oral cancer cases occur in people who never smoked. The best way to catch oral cancer early is to have regular exams by Dr. Smith and Dr. Mandava and to learn how to check yourself. About 90% of people with mouth cancer and some types of throat cancer have used tobacco. The risk of developing these cancers increases as people smoke or chew more or for a longer time. About 37% of patients who continue to smoke after cancer treatment will develop second cancers of the mouth, throat or larynx. This compares with only 6% of those who stop smoking. Tobacco smoke from cigarettes, cigars or pipes can cause cancers anywhere in the mouth or the part of the throat just behind the mouth. It also can cause cancers of the larynx, lungs, esophagus, kidneys, bladder and several other organs. Pipe smoking also can cause cancer in the area of the lips that contacts the pipe stem. 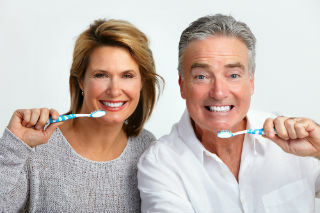 The brush test is a quick and painless method that Dr. Smith and Dr. Mandava may use to test the common small white and red oral spots that most people have in their mouth at one time or another. The brush test is used to determine if a common oral spot contains abnormal cells (known as dysplasia) that, if left alone for several years, may develop into oral cancer. The use of the Oral CDx BrushTest by over 30,000 U.S. dentists has resulted in the detection of over 10,000 precancerous spots – years before they could cause any harm – years before they could turn into a problem. Our doctors can now painlessly help diagnose a disease that kills as many Americans as melanoma and twice as many as cervical cancer, and is rising among women, young people, and non-smokers. Over 25% of oral cancer victims do not use tobacco or abuse alcohol. It typically takes several years before a dysplastic oral spot can turn into an oral cancer, and during this time, the spot can be removed and oral cancer can potentially be prevented from even starting. Just like the Pap smear is used to detect precancerous cells to help prevent cervical cancer, and colonoscopy is used to detect precancerous polyps to help prevent colon cancer, the brush test is used to detect precancerous cells in common oral spots to help prevent oral cancer. The good news is that oral cancer has now joined the short list of cancers that can be stopped years before they can even start. What is the Brush Test? A specially designed brush that a dentist uses to painlessly obtain a sample of an oral spot. The brush test requires no anesthesia, causes no pain and minimal or no bleeding. The analysis of that sample takes place at a specialized laboratory where specially-trained pathologists use highly sophisticated computers to help detect abnormal cells. A complete report is faxed to us as soon as the test results are available. We will call immediately after we receive the report to inform you about the findings, and if necessary discuss additional treatment options. When is a CDx Brush Test used? The brush test is used to test the common, harmless-appearing, small white and red spots that dentists and dental hygienists see several times each week, to determine if they contain precancerous cells. Most people will have a small oral spot like this at one time or another and they can be seen in up to 10% of carefully examined adults. Is the Brush Test Accurate? The brush Test is very accurate as confirmed in many published clinical studies. It has been used by over 30,000 U.S. dentists, and more than 10,000 precancerous spots have been detected with the brush test – long before they could cause any harm – long before they could turn into cancer. Most people will have tiny white or red spots in their mouth at one time or another. Although most of these spots are harmless, only laboratory testing like the brush test can determine which of them contain abnormal cells. About 96% of small, harmless-appearing oral spots that are evaluated by the brush test will not contain any abnormal cells. If precancerous cells are found in an oral spot, it typically takes several years before they can cause any harm. During this time, the spot can usually be easily and completely removed. Adults over 35 lose more teeth to gum disease (periodontal disease) than from cavities. Three out of four adults are affected at some time in their life. Regular daily tooth brushing and flossing techniques are the best way to prevent cavities and periodontal disease. Periodontal disease and decay are both caused by bacterial plaque. Plaque is a colorless film that sticks to your teeth at the gum line. Plaque constantly forms on your teeth. By thorough daily brushing and flossing, you can remove these germs and help prevent periodontal disease. Position the brush at a 45-degree angle where your gums and teeth meet, and start brushing the outside surfaces of your teeth. Gently move the brush in a circular motion several times using small, gentle strokes. Use light pressure while putting the bristles between the teeth, but not so much pressure that you feel any discomfort. If you have any pain while brushing or have any questions about how to brush properly, please be sure to call the office. In total, the average person should brush between 2 ½ -3 minutes. Sometimes after dental treatment, teeth are sensitive to hot and cold. This should not last long, provided your mouth is kept clean. If your mouth is not kept clean, the sensitivity will remain and could become more severe. If your teeth are especially sensitive, consult with your doctor. They may recommend a medicated toothpaste or mouth rinse made especially for sensitive teeth. There are many products on the market which can be confusing and make choosing between them difficult. 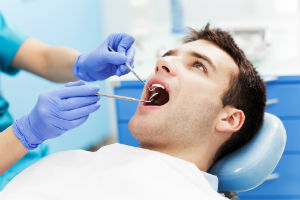 Here are some suggestions for choosing dental care products that will work for most patients. Automatic and high-tech electronic toothbrushes are safe and effective for the majority of patients. Oral irrigators (water spraying devices) will rinse your mouth thoroughly, but will not remove plaque. You need to brush and floss in conjunction with the irrigator. We see excellent results with electric toothbrushes and recommend Triumph by Oral B. Some toothbrushes have a rubber tip on the handle; this is used to massage the gums after brushing. There are also tiny brushes (interproximal toothbrushes) that clean between your teeth. If these are used improperly you could injure the gums, so be sure discuss proper use of these brushes with the hygienist. What you eat and how frequently you eat it affect your dental health. Eating starchy foods cause the bacteria in your mouth to feed on it. They then produce acids, which attack your teeth for up to 20 minutes or more. Foods that stick to your teeth or are slow to dissolve give the acids more time to work on destroying tooth enamel. Sticky and starchy foods create less acid when eaten as part of a meal. Saliva production increases at mealtime, rinsing away food particles, and neutralizing harmful acids. Sealants are highly effective in preventing decay on the biting surfaces of your chewing teeth. Sealants are a simple procedure in which a tooth-colored acrylic “coating” is painted onto the surface of the tooth. This effectively “seals” the deep grooves acting as a barrier, protecting enamel from plaque and acids. Both children and adults can benefit from sealants in the fight against tooth decay.